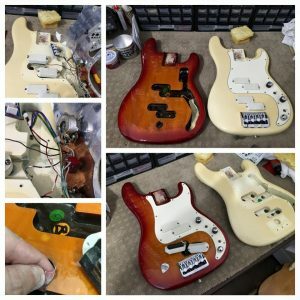 In addition to the finest musical electronics service and repair, Desert Amplifier Repair also offers custom guitar and bass electronics wiring, modifications and setups allowing your instrument to do all the tricks of your favorite player’s signature model or whatever your heart desires. From simply changing the tone capacitor to smooth out the highs or add more body, to brightening or darkening the tone, to changing potentiometers to adjust the roll off and how they interact with your playing and tone shaping. Coil-tapping humbuckers, single coil pickup installations, phase switching, push-pull pots and everything in between – DAR has got you covered. The sky is the limit, if you can dream it, DAR can probably find a way to make it happen and wire it to work for you. 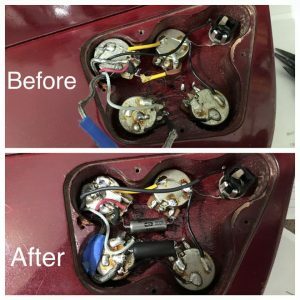 Give us a call or send us an email and see what Desert Amplifier Repair can do for you! Why choose our professional setups? 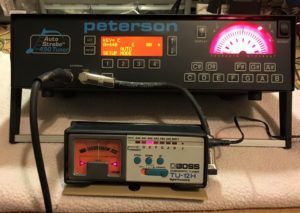 With over thirteen years of experience working with musicians, listening to their needs and desires around an instrument setup, Desert Amplifier Repair has an understanding of the finer details in setting up an instrument. 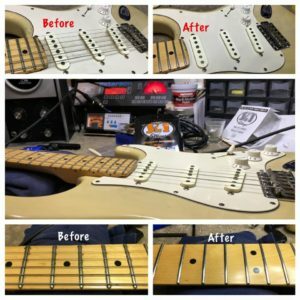 DAR knows that each instrument is unique, and with that we believe our instrument setups are one of the most sought out services we offer. With our professional setups, DAR is sure to improve the playability of your instrument, regardless of the brand. Every aspect of our instrument setups are executed with the highest standards, utilizing the latest specialty tools, measuring devices and professional equipment – and all setups are covered by our guarantee. (See terms & conditions at bottom of page). When you decide on a DAR setup, all the aspects of the work schedule will be discussed in detail before any work is done. DAR will factor in playing style, tuning, action preferences and any issues you may be having with your instrument, as well as string brand and gauge. Desert Amplifier Repair is an authorized dealer of Lay’s S.I.T. Strings strings, and we include a new set of SIT Power Wound or Pure Nickel strings in 9’s or 10’s in the price of the standard electric guitar setup. Bass guitars and 12 strings do not include strings in the price of setup. Additional string models and sizes are available at a surcharge and we can always use your own supplied strings, however it will not discount the cost of the setup. Please contact us If you are considering a professional setup and we would be more than happy to discuss all options. Personal preference: Guitarists have varied needs, preferences and demands when it comes to the feel of their instrument. Most reputable retailers assume serious players will have their new guitar professionally setup to their personal preferences after purchase. DAR offers professional instrument adjustments for a wide variety of players and styles. Some are with touring bands and others are just starting out. From classic rock to metal, folk to country music, DAR setups cater to all players. New guitars are no exception: Most new guitars purchased from music stores or online will have the standard manufacturer’s factory setting. Unfortunately these settings can vary and are susceptible to the effects of storage issues, long-distance travel, poor handling and weather conditions. Combined those factors can have a detrimental effect on string action and can render the instrument unplayable. Many music stores display their instruments on hangers for months while getting played by numerous potential customers before the sale. They are normally restrung soon after purchase and that’s when playability problems usually emerge. The checklist below includes most of the standard settings and adjustments commonly carried out at DAR, based on a typical guitar setup. The guide does not take into consideration any additional fretwork or replacement of worn components that may be required. Visual inspection/testing: Check for loose, worn, uneven frets across the fingerboard. Look for any worn or corroded components like rust and debris in screws and saddles, worn top nuts, dysfunctional truss rods, faulty tuners, scratchy potentiometers, intermittent or failed electronics. 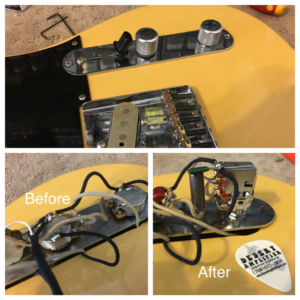 Cleaning of all components: DAR thoroughly cleans everything from the bridge, tuners and electronics (if required), to the body finish. DAR uses specialized cleaning products and at this stage of the setup will include polishing of the frets and oiling of rosewood and ebony fingerboards (if required). Restringing: DAR will supply, fit, and advise on any brand, gauge and type of string. DAR is an authorized dealer of Lay’s S.I.T. Strings strings. Whether you are dropping the tuning and using heavy gauges for metal styles, or using flat-wounds for jazz, new strings will always be required on all new setups. Neck adjustments: One of the most influential adjustments on the setup is the bow or relief of the neck. Too much relief results in high action, poor playability and bad intonation, among other problems. Too little neck relief and you will suffer string/fret buzz, dead spots, and choking of notes when bending strings. 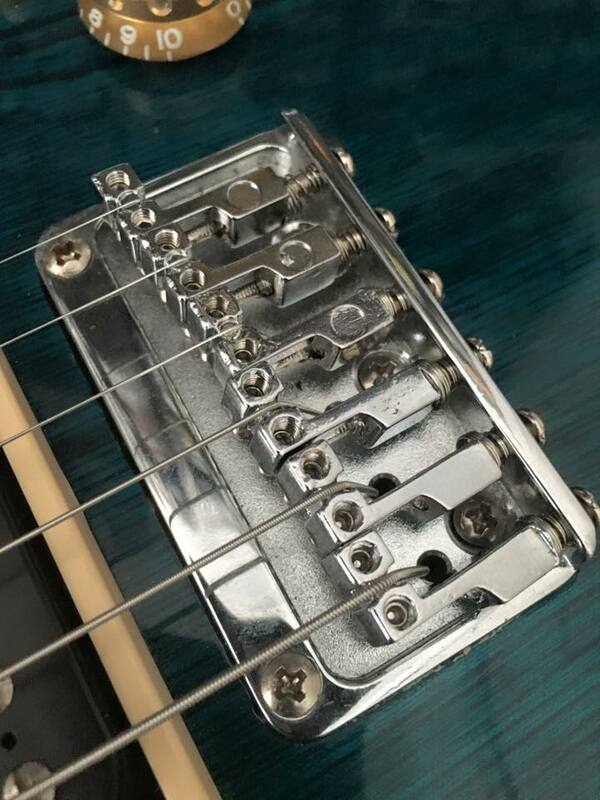 Correct neck adjustment is essential when installing heavier string gauges or dropping the tuning on an instrument. Rock/metal setups in particular require exact balance between the truss rod and string tension to minimize fret buzz. Nut action: Obtaining the correct balance and action at the nut is a crucial step in the setup procedure. 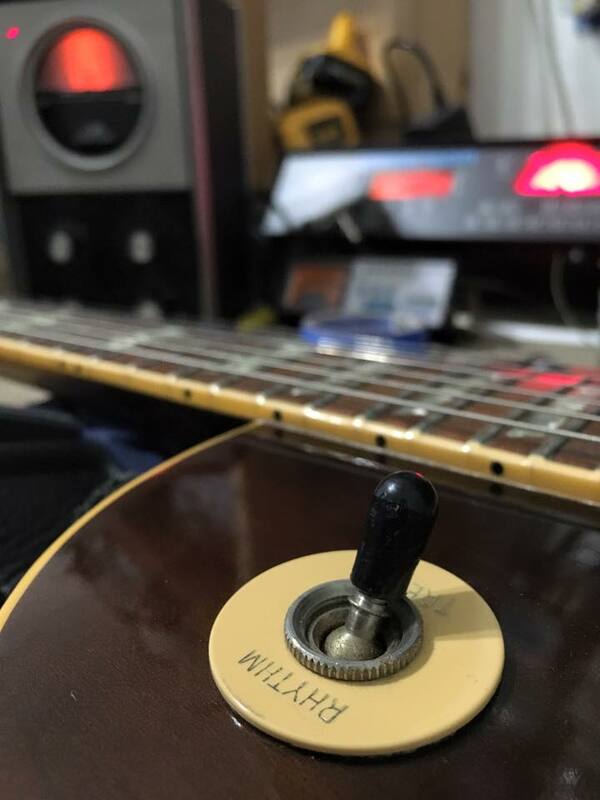 Poorly slotted or worn top nuts can cause open strings to buzz, tuning problems, string breakage, poor intonation and lack of sustain. Nut slot size has to be precise, and installing significantly lighter strings can sometimes render a nut useless. 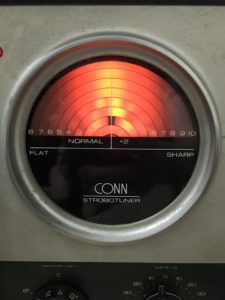 Heavier gauges require slot widening to avoid string grabbing. Pickup adjustments: Correctly adjusted pickup heights ensure even output across all selector positions, while minimizing distortion and magnetic string pull. Setting the intonation: This final stage involves fine-tuning of the moveable saddles at the bridge (where possible). This is to ensure the instrument plays in tune and as evenly as possible, over the entire fretboard. 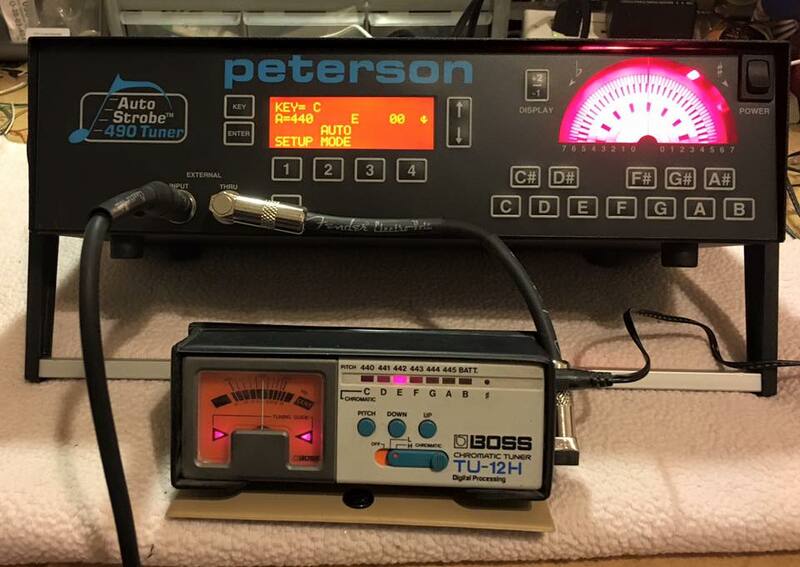 The intonation is checked between the 12th fret and the bridge using a calibrated Peterson 490 Auto-Strobe tuner. CONN ST-11 Strobotuner available upon request. Report: All adjustments are re-checked after 24 hours or so and the instrument is then given a final test/clean. A full report is standard with all our setups. This will include detailed information on every adjustment carried out and any additional repair work involved, along with cost details. Fret problems: Inevitably not every guitar setup is straightforward. General wear and tear along with shortcuts in manufacturing standards can limit the level of accuracy for correct adjustment. It only takes one slightly high fret to dictate the action for a whole fretboard. 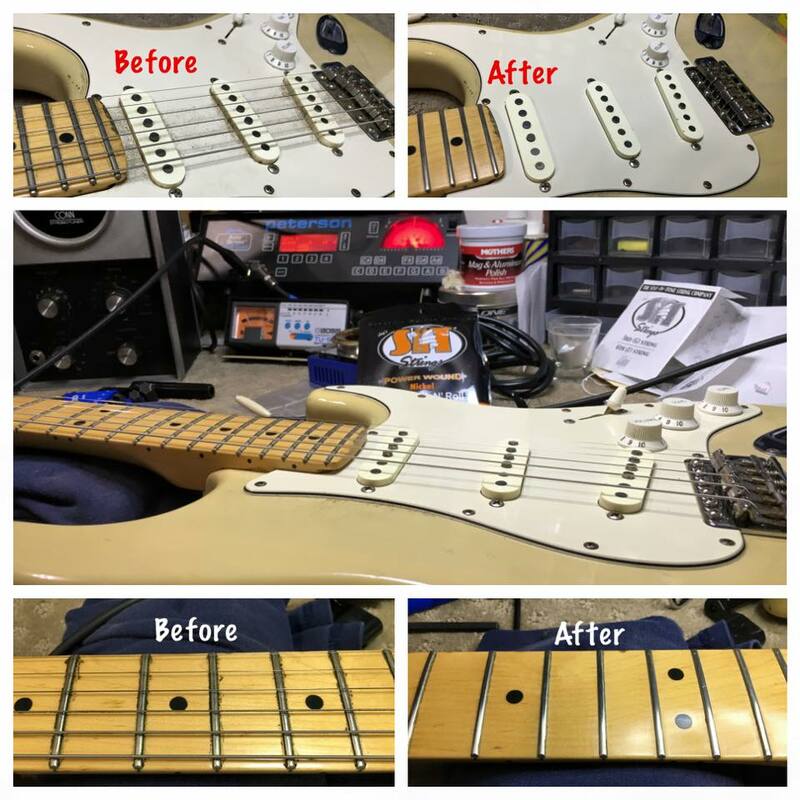 We always allow for the dressing of one or two frets and the odd part replacement in our setup costs, simply because experience has shown us it’s often the difference between an average and great setup. 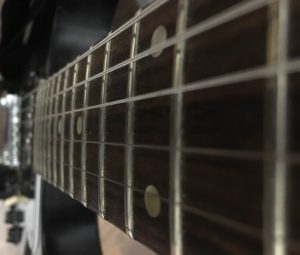 Fret dressing or possibly re-fretting of the whole fretboard may be necessary if there is evidence of substantial fret wear. We will always advise you accordingly if extra work is needed and do our best to keep your costs down. Our work policy: DAR always guarantees, with no exception, to make all the necessary step-by-step adjustments covered in our setup procedure list. Should we notice any other work that we feel may need attending to on your instrument, we will discuss this with you and only proceed if requested to do so. Turnaround times: Allow a time frame of at least 3 days with setups. This gives the instrument a chance to acclimate to the shop for 24 hours before starting the setup and enough time to settle after making any adjustments, before the final rechecking. We have found this makes for a better quality setup. In the event that other work is necessary, (fretwork for example) or additional parts are required, turnaround times can be longer. We will contact you if we are unable to meet an agreed turnaround time.